An interesting design solution for all of your bar or kitchen prep needs, this jumbo oval-shaped copper sink features a flat rim suitable for drop-in or undermount installation. The flat bottom of the sink allows you to put dishes or glasses inside without sliding. 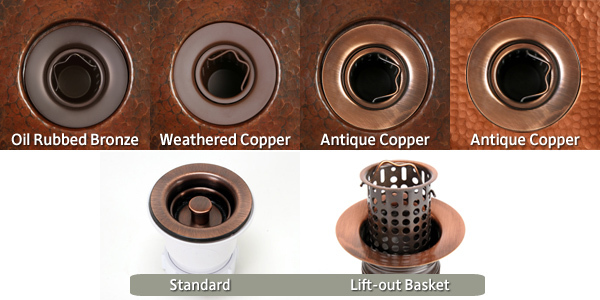 This sink is hand-hammered in 16 gauge, lead-free copper by 3rd generation coppersmiths of SoLuna. Four unique finish patinas are available for your choice: Dark Smoke (pictures #1-2), Cafe Natural (pictures #3-4), Matte Copper, Rio Grande. We are happy to create a custom order for you. If you're interested in adjusting the dimensions or making other modifications please feel free to call us Monday through Friday, 7am - 4pm PST at 877.340.0800. This item usually ships in 2-3 weeks.